We’d love your help. Let us know what’s wrong with this preview of 500 Social Media Marketing Tips by Andrew Macarthy. The Amazon Kindle Web Marketing #1 Bestseller - now in paperback! Struggling With Social Media Marketing? Few likes on your company's Facebook page? Not seeing social media ROI? Unsure how to make the most of social media marketing, or even where to start? 500 Social Media Marketing Tips can help! 500 Social Media Marketing Tips is your guide to social media for business, w The Amazon Kindle Web Marketing #1 Bestseller - now in paperback! 500 Social Media Marketing Tips can help! 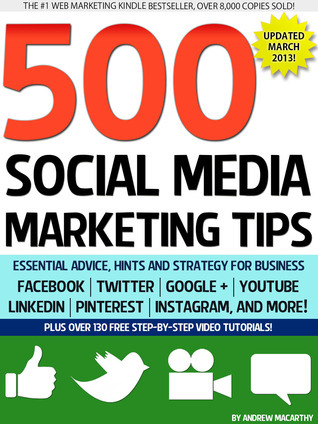 500 Social Media Marketing Tips is your guide to social media for business, with 200 pages packed with information and advice covering all of the web's biggest players, including Facebook, Twitter, Pinterest, Google+, YouTube, and more! This book provides simply-written expert tips about how to build your brand in social media spaces, attract and engage with customers, and increase sales! To ask other readers questions about 500 Social Media Marketing Tips, please sign up. This book offers a basic high level overview of social media marketing, but it also offers great creative suggestions that one can build off of. Also includes extra online content and in-depth articles. Very useful, packed with tips you can use straight away for your own business. And a real bargain too. This book offers a high-level knowledge about the social media in general and about each platform specifically. It is well organized, and straight to the point. It not only offers solutions but also links to softwares and tutorials (free and paid) that help you hit your target!! In my case, I only use Instagram so i could easily just skip the chapters of the other platforms and jump to Instagram to learn more about it. Good- was able to take a few ideas away for both the non-profit I volunteer for and the non-profit I work for - brand strategies with simple suggestions on real things you can do to up your social media game. Great resource manual that I'm embarrassed to say I haven't even begun to fully utilize in implementing its many tips. Good stuff though. Recommended. Intelligently written with tons of useful advice. Recommended reading even if you are already a user of most of the platforms. Ok but rather repetitive and I'm not sure if there really are 500 tips here. Sometimes a bit too American focused which is odd as the author is from Swansea. Some of the tips did seem good but I'm unsure how good as I've not had enough exposure to the various medias. If nothing else, I've learnt that I'm really not "excited about Social Media" as job descriptions often say these days. Social Media can even be positively enchaining - fancy having to answer all Twitter feedback in 30 mins. You migh Ok but rather repetitive and I'm not sure if there really are 500 tips here. Sometimes a bit too American focused which is odd as the author is from Swansea. I learned a lot of technical aspects to various social-media sites. So, I would give this five stars as "(Presumably) 500 (Unnumbered) Social-Media Technical Tips". If you have been a student of Dan Kennedy, then you will be disappointed. This book does NOT justify or explain with solid research how social media will increase your sales. So, I would give this one star as a book about marketing strategy -- two words that the author uses in his title. Averaging those two ratings, I give it three stars I learned a lot of technical aspects to various social-media sites. Averaging those two ratings, I give it three stars. Just remember what you're getting -- a technical book, not advice about how to use social media to raise your profit. This is an absolutely invaluable resource. Every you're a social media marketing pro who just want a few extra tips or perhaps some ideas on how to combine some basic ideas into a power strategy or you are a novice just learning the basics, 500 Social Media Marketing Tips has a lot to offer. I could not believe just in depth and well-written this book was. Add to this the fact that the author regularly updates it so that the tips are always up to date makes this an absolute steal. This is by far This is an absolutely invaluable resource. Every you're a social media marketing pro who just want a few extra tips or perhaps some ideas on how to combine some basic ideas into a power strategy or you are a novice just learning the basics, 500 Social Media Marketing Tips has a lot to offer. Lots of stuff here to read. I already knew a fair bit of it, but learned a lot, too. Yes, you could get a good chunk of the info elsewhere, but I think this'd make an excellent reference book, saving time by keeping social media marketing strategies at your fingertips. And the free lifetime updates are experts only an excellent selling feature. Holy crap this was good!!! Not a bad book, but I was expecting to find some social media strategies which unfortunately, there wasn't. I guess it's in the title - these are a list of tips for each of the most famous social media platforms which will definitely be helpful to beginners. This book is jam packed with information. There's a lot of practical tips and it isn't possible to remember more than 1-2 at a time. So this book can be used as a reference book which you keep visiting to pick up something each time. This is helpful, and covers the prominent social media channels. I am competent and experienced with social media, so it was great to find a book that kept both beginners and intermediate users in mind. I've recommended this book to others, as its advice is practical and readable. This book is exactly what it says it is. A list of marketing actions for social media. It is nice to have them all together in one place and there is even a few tips in there that I had never thought of. Formatting is nice and easy to follow. Full of tips. For social media. I was looking for ideas of what I could do, and I found some. The book was oriented towards business, but many of the ideas could be applied to promoting books. Which was what I needed. This is a great book filled with useful, practical ideas for social media business marketing from an obviously very informative author. Excellent tips & very current! The book had a lot of already known facts to it, but there were quite a few things I didnt know about. I do recommend this book. The social media tips in this book are relevant and can be used to enhance social media management of your business. Lots of good tips on the use of FB, Twitter, Google+, YouTube, Linedin, Pinterest, etc. Some new things introduced. Short and sweet tidbits. Andrew Macarthy is a blogger and social media strategist. His #1 Web Marketing Bestseller, 500 Social Media Marketing Tips, has helped thousands of businesses with simple, practical advice to optimize their social media activity and make the most of the sector's marketing opportunities.